Have we all stopped doing that healthy eating New Year’s resolution thing yet? Yes? Good. Time for some deep fried fish. The fish finger sandwich is something we tend to associate with childhood…or hangovers. Four or five of those uniform, orange-crumbed sticks between factory sliced pappy white. Of course, your choice of saucing says something about your place in the world. Will it be ketchup? HP? Tartare? And what about plain old butter and vinegar? People will defend their choice to the last crumb. Here are five of the best fish finger sandwiches in London, from the traditional, to the fancy. Hix’s fish dogs are now big on the fish finger sandwich ‘scene’. Yes, that’s definitely a thing. Chef Mark Hix has cashed in on the street food trend with these posh, panko-coated coley fish fingers. 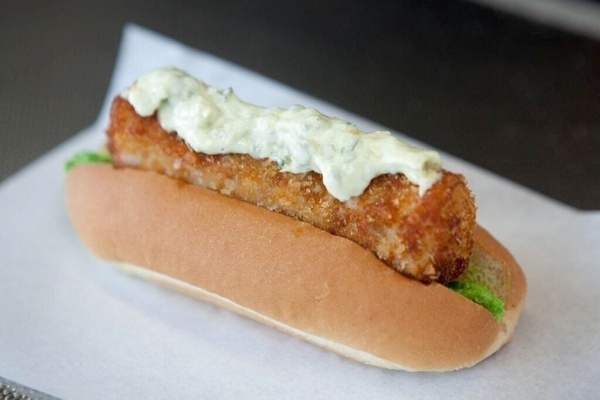 Served in a soft hot dog bun with minty-mushy peas and tartare sauce, this is a dog done very well indeed, with expertly cooked fish and an ultra crunchy, uniformly golden crust. See their Twitter feed or website for locations. 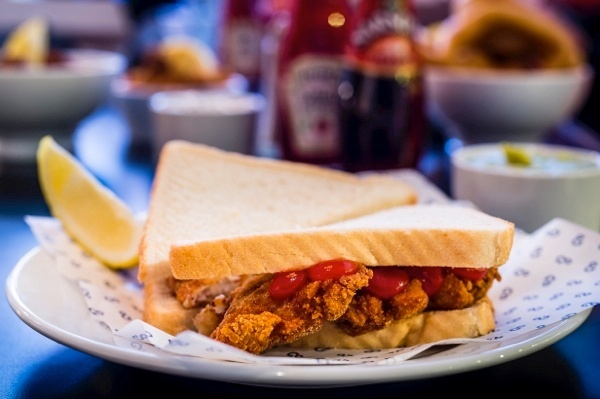 Kerbisher and Malt’s fish finger butty uses sustainably caught fish, fried and elegantly slapped between two pieces of plain ‘chip shop style’ white. There’s a shiny golden base of butter waiting to melt once the hot fish fingers hit, while the saucing is left entirely up to you. Okay so it’s not strictly a fish finger sandwich but it’s just so good it has to go in. You’ll need to keep your ear to the ground on this one, as the Daryl Hannah only goes on as a special every now and then at Lucky Chip, who name all their sandwich variations after celebrities. This hunk of haddock fillet comes with perfectly pitched tartare sauce (lots of it) and cheese. Anyone with any affection for the golden arches version will find heaven in this sandwich. This has got to be the most trend ticking of all the sandwiches in the list, with panko crumbed fingers, ‘slaw (that’s what we call coleslaw nowadays) and tartare sauce on a brioche bun, but that’s okay, because it’s tastes really very good indeed. The residents of New Cross have been blessed with this local gem, Maddys Fish Bar. 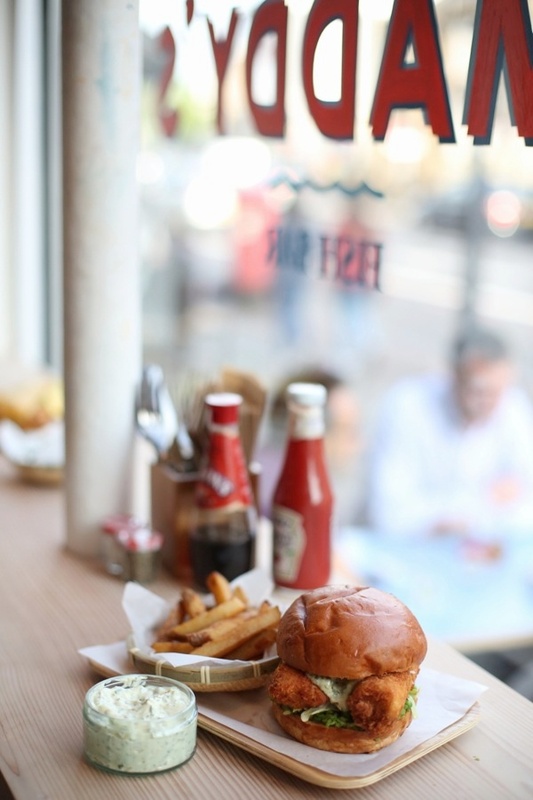 Find a deal for restaurants in London.